Your family will love our scenic and informative tour! Welcome to Pine Tree Apple Orchard! Come savor our fresh, locally grown apples and strawberries. Pick Your Own and Picked For You. Check out our Apple Calendar for varieties and harvest times. Baked fresh and fresh frozen pies and others treats ready to take home. We host a variety of activities throughout the fall. Try your luck in our Corn Maze this fall! Pie, Roasted Seeds, Jack-o-lanterns...get your pumpkins here while supplies last. Pine Tree Orchard takes growing apples very seriously. We are committed to growing high-quality fruit in an environmentally sustainable method. 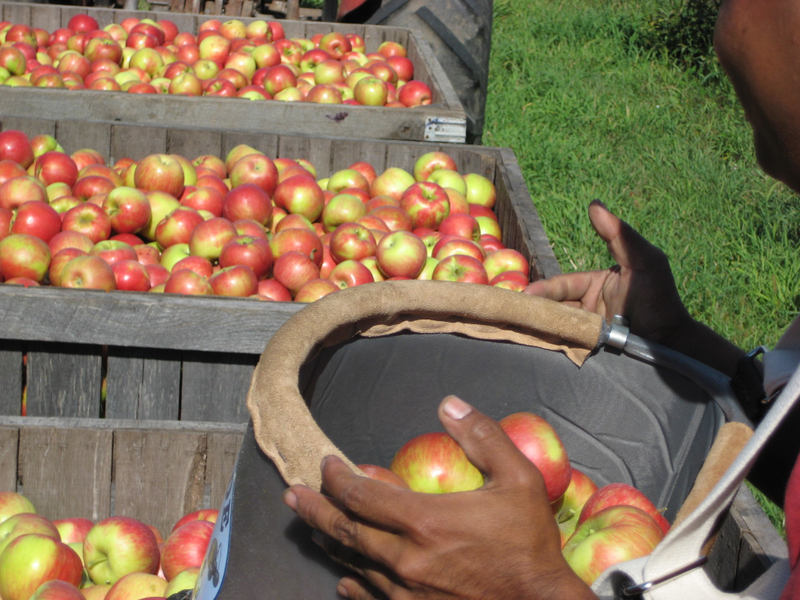 We are part of the Minnesota Grown Program and Minnesota Apple Growers Association. that we have picked for you. Apple availability can change quickly. If you are looking for a specific variety please call ahead for updates. Please call 651.429.7202 before driving out. Harvest times are heavily dependent on weather conditions throughout the spring and summer. Please check back in mid to late August for an estimated harvest update. The Duchess apple, also known as Duchess of Oldenburg, is a tart flavored apple ideal for cooking. Whitney's are small, sweet, edible crabapples. They are mostly used for canning, preserving, pickling, and spicing. The First Kiss is similar to its parent the Honeycrisp in flavor and texture but ripens a month earlier. Also known as the Arends apple, the Paula Red has a mildly sweet flavor. Its common uses include baking, sauces, or cider. The Beacon is a crisp, tart, juicy apple which is best used for baking. The Zestar, also known as the Minnewashta apple has a sweet tangy flavor. It's best known for fresh eating. The Sweetango is the product of combining Honeycrisp and Zestar, resulting in a sweet yet tart and citric flavor. One of the top fresh eating Fall apples. The Dolgo is a unique crabapple variety, in that it is one of the few that pass for fresh eating. With a tart and juicy flavor, Dolgo's are preferred for fresh eating and making jelly. The Wealthy apple has a vinous flavor with fruity tones. Excellent for fresh eating or in desserts like pies, crisps, and sauces. It works well for cider too. Chestnuts crabapples are a larger variety of crab with a rich and nutty flavor. Great for fresh eating and for use in making sauces. What sets the McIntosh apple apart is its perfume-like aroma. It's an all-purpose apple meaning it's great for eating fresh, cooking, cider, and juice. The Virginia Crabapple, also known as Hewe's Crab, is mainly used for cider production and adds a dry flavor to cider blends. The Lakeland has a juicy, mildly acidic flavor. Although it can be considered an all-purpose apple, it's best used for pies and sauces. The Cortland is characterized by its sweet vinous flavor and it's slow to brown, making it a superb salad apple. Also great for any cooking. The Haralson has a complex tart flavor, primarily used for fresh eating and cooking. Haralson's are especially good for pie. The HoneyCrisp is known for it's well-balanced crisp and juicy flavor. A definite winner for fresh eating and salads. The Red Delicious was bred to be shapelier and redder, hence the name. It has a crisp, sweet flavor when eaten fresh. The Regent is known for well-balanced flavor: light, sweet, and fruity. It's great for fresh eating and cooking. The Fireside or Connell Red apple has a crisp, sweet, and juicy flavor. It's good for fresh eating, salad, and baked apples. The Golden Delicious apple has a very sweet taste and a distinct yellowish-green skin. Its favorite uses are for salads, sauces, and apple butter. The Honey Gold is a cross between a Golden Delicious and a Haralson. The taste is very similar to the Golden Delicious which is very sweet and great for fresh eating. The Snowsweet is a fairly new variety of apple with a sweet, slightly tart flavor and rich overtones. It's slow to brown as well, making it a perfect choice for fresh eating, snack trays, and salads.